Shopping is a major attraction of Tokyo, and the Outlet Malls are no exception. While there is a lot of information out there on the different outlet malls, the information isn’t very detailed, and it’s difficult to understand the history of outlet shopping in Tokyo. In Japan, shopping in large shopping malls, much less outlet malls, is a new concept. Based on my short research, the first outlet mall is Outlet Mall RiSM located in Saitama. This was opened in 1993. It’s a fairly small outlet mall, from what others have said, and from their website, caters mostly to Japanese brands. It isn’t too far from central Tokyo, but probably not worth a trip for the average person. 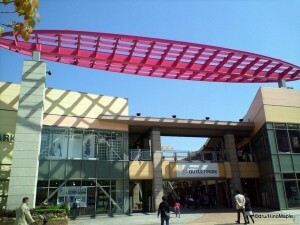 There are several other “independent” outlet malls with locations in Machida (western Tokyo) one on Chiba which is east of Tokyo, and a new one that opened in Odaiba’s Venus Fort in December, 2009. Do note that the Odaiba outlet mall is small but worth a short visit if you are in the area. In general, there are only two companies that have outlet malls that are worth visiting. 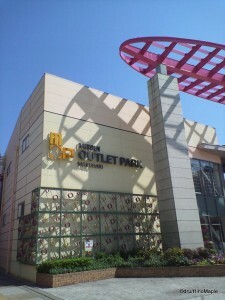 Mitsui Outlet Parks are the largest chain of outlet malls in Japan. They have 10 locations throughout Japan and 4 within the Tokyo area. Depending on where you are staying or living, each one is convenient. For those living on the east side of Tokyo, or in Chiba, the Makuhari branch is the best. It is located next to Makuhari Messe and a lot of their business is from people visiting the convention centre and doing a little shopping at the same time. This outlet mall is pretty good overall. While it isn’t huge, nor is it the best, for those looking to go somewhere close by, and for only half a day, this is a good location. Due to its relative close proximity to Tokyo, it can be very busy at times. 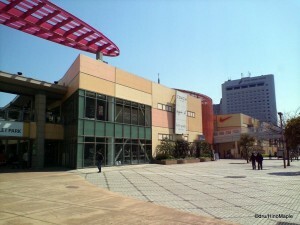 The other close mall would be the Tama Minami Osawa branch, located in Tama. This one is best for those living on the west side of Tokyo. From what I have heard, it isn’t that great, but very convenient and close enough to Tokyo to enjoy. The last convenient branch would be the Yokohama Bayside. This isn’t convenient for anyone in Tokyo, but for those in Yokohama, it’s a wonderful place to visit. It’s large with many shops to see. Unfortunately, it’s far from the station, about a 5-10 minute walk, and there is nothing else to do after you have finished. It can take nearly one full day if you are travelling from Tokyo. For those living in Saitama, or north western Tokyo, a trip to Iruma is also an option, but not convenient unless you have a car. This is one of Mitsui’s largest outlet malls, and the newest one in the Tokyo region. Unfortunately, it’s too far from the station making it tough for a regular tourist to visit. Personally, and by many accounts on the internet, Gotemba Premium Outlets is the best outlet mall near Tokyo. It is locate about 1.5 hours west of Tokyo and requires a bus to get there. It’s located near the foot of Mt. Fuji creating a very picturesque scene for shopping. Do note that Mt. Fuji is often obscured by clouds, and I have never really seen it when I have been to Gotemba. Then again, I have been very unlucky and only visited Gotemba when it was raining. This mall is huge, to say the least. It can take several hours to get through all of the shops, but it can be worth it. The food may be expensive, but thankfully, there are several places for children to have fun, including a small amusement park. Do beware of the crowds on the weekend as it’s very popular. Compared to the Mitsui outlet malls, Chelsea is more upscale with more foreign brands due to its foreign ownership. For those looking for a cheap shopping experience near Tokyo, you can’t really go wrong with the outlet malls. The only down sides are that they tend to be farther away from central Tokyo. They also can’t compete well with the large sales that happen every few months at the department stores. The amount you save on travel expenses may be more than enough to say home. However, it’s still a great experience to see the other areas of Tokyo that few people experience. If you are looking for a basic shopping mall, there are a few in eastern Tokyo, such as Lalaport Toyosu and Olinas Mall in Kinshicho. This entry was posted in Kanto, Tokyo and tagged Chelsea Premium Outlets, Chiba, Gotemba Premium Outlets, Gotenba Premium Outlets, Iruma, japan, Keihin Makuhari, Lalaport, Machida, Makuhari, Makuhari Messe, Mitsui Outlet, Mitsui Outlet Park, Odaiba, Olinas, Outlet Mall RiSM, Outlet Malls, Premium Outlets, RiSM, Shizuoka, tokyo, Tokyo-to, Toyosu, Venus Fort, Yokohama, 日本, 東京, 横浜 by Dru. Bookmark the permalink. Yes, Toyosu does look pretty at night. Hard to get around to every location in Tokyo every year since it’s so big.